Personality, it's a funny thing. I have twin almost 2 year old nieces & they are FULL of personality. Despite their twin-ness, completely different personalities at that. But where did it come from? They haven't had many "character building" life experiences, they didn't take a Summer to backpack across Europe to "find themselves", they haven't really even spoken a full sentence yet. So, it's just been there all along?? Before I blow your mind with lots of existential ramblings, let me just say this - I have been thinking about personality a LOT lately. Tyler & I just completed a pre-martial counseling course. No, there aren't any lovers spats, just a recommended series of classes aimed at starting your marriage off on a strong, logical foundation. We talked about things like budgeting, hopes & dreams for the future, splitting holidays with our soon to be blended family, & how our personalities aligned. Side note: if I had to do it again, I might have majored in Psychology in college. I remember staying up & reading my Psych book cover to cover for FUN one night. I elected to write a Psych thesis (on birth order - fascinating stuff) & continue to hold a fixation with the subject. So getting to take an official Myers-Briggs personality test during our pre-marital course was RIGHT up my alley. All my life I have been told that I'm loud, outgoing, talkative, boisterous even. And I made that my own. I was the talkative one. The loud one. The outgoing one. But where I fall on the Extroversion-Introversion scale turned out to be dead center, & after thinking about it, I think it is dead on. I really am a little bit of both. I am a internally reflective people person. And I'm currently going through a bit of an extra introverted period of my life… & loving it. Just of note: I was ALLLLL the way on the J (Judging) end of the spectrum - very organized & a planner, spontaneity killlls me… to maybe a bit of a fault. Whereas Ty was ALLLL the way at the other end, with his P (Perceiving) personality… but otherwise we are the samsies. … but these pants are definitely extroverts! What part of your personality is your most defining? Anyone else a Extrovert/Introvert personality dweller? Ok this photo backdrop is amazing! I'm definitely an extrovert but I do enjoy my alone time; not sure what "type" that makes me. I also really love those freaking pants!! A little annoyed I passed up hot pink pants a few months ago becuse it was "winter". Such a fun outfit, and love that backdrop! I am fully an introvert, although I can certainly talk when among friends. I also like to let my outfits do the talking. My husband is more outgoing, but I think we balance each other out. So interesting to think about! Those pants!! So sassy and fun. So funny you wrote about this today - I just took the Myer-Briggs assessment yesterday and was amazed that they hit my personality dead on. It's kind of crazy! I was a ENFJ - so I totally understand the pre-planning! I'm a bit more of an introvert, definitely a planner, and I hate last minute changes. 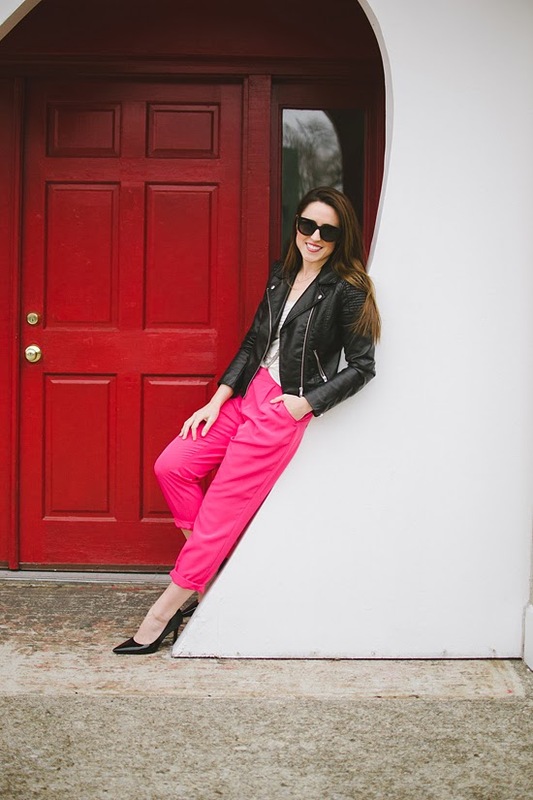 Love this look, the pink pants are so much fun! I totally agree with pre-marital counseling. Sahir & I are looking into it as well :) Def taking this personality test as well, it's so important to have open lines of communication! Those pants are all sorts of fabulous. I think my personality is somewhere in the middle. My husband is a bit more outgoing than me, especially with strangers. It takes me a bit longer to warm up to people for sure. Love this look & that doorway! Fabulous! Awesome pants! I love talking about psychology, especially birth order. I have a coworker who did her thesis on birth order, and we could spend hours talking!! I am loving those pants and heels paired together! I was a psych major in college and I still love that stuff! I think it's interesting that when we get down to it and really study ourselves, we can find aspects that we didn't know existed, like some introversion! Interesting stuff! And I love this outfit on you! love the heart shaped doorway you're standing in! and that coat looks so luxe - not faux at all. I am an introvert all the way! People are exhausting. But I would totally wear those pants, even at the risk that strangers would come up and compliment me...and then I would have to talk to them. My coworkers and I are unhealthily obsessed with the Myers-Briggs test. I guess it's because we're educators and all took very person-centered jobs? I'm INFJ, but I think being E or I totally changes depending on the situation. Around people I'm comfortable with, I'm fine being in the middle of it all, but starting a new job this fall made me realize how introverted I am until I'm comfortable. The J is dead-on though. If I can fully plan out something ahead of time, I get crazy anxiety! Oh, I'm also loving the shade of these pants and that background! Who knew heart-shaped doorways existed? I love the necklace, too. Where did you get it?? 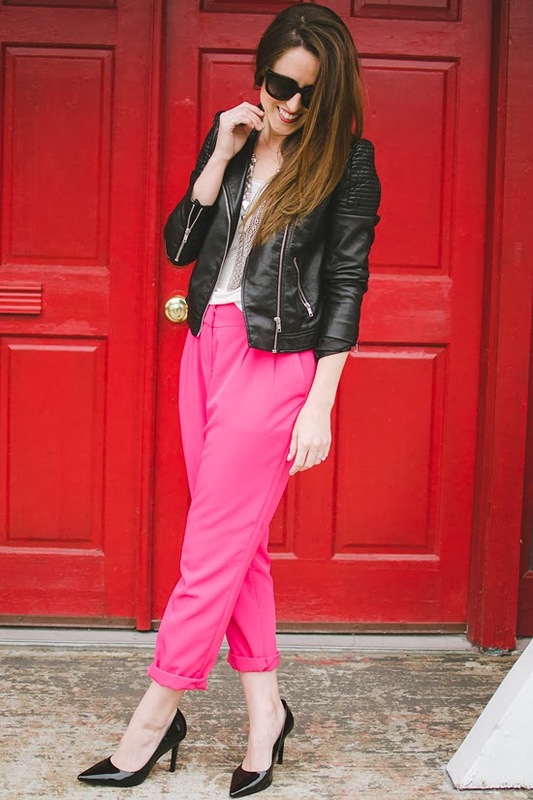 What a lovely look, the pants are totally fun and bright! I think I used to be super extroverted and bubbly but I've learned to become more of an observer, I can keep silence for some minutes now, lol. ps. the location is dreamy! Thanks lady. It is an ancient purchase from a boutique in my home town, sorry I can't be more helpful! How is that heart shaped house thingy so dang cute?!!?! like seriously. And I love your jacket- so jealous that you can wear a jacket and tank and not freeze! (I guess we're warming up too, not too far behind you guys, but still). And I'm just a little curious to your arrangement with Zipporah- she takes the most lovely photos of you (though your tripod photography was pretty dang good too!) Since she takes so many of your photos these days, do you just meet up with her every day for your photo shoot? Do you pay her or trade advertising on your blog for her photography services? I'm so curious, and I apologize in advance if it's private info, I don't mean to pry! Oh my gosh your pants are gorgeous! 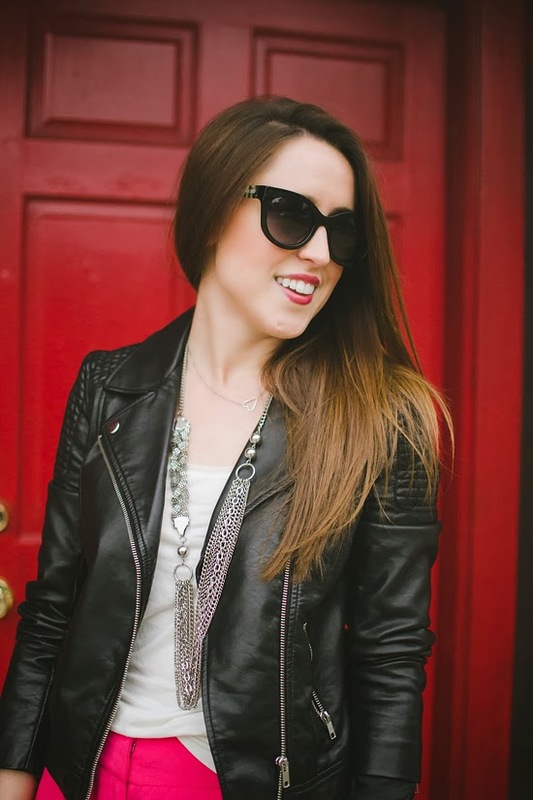 Love your whole outfit! And what a fun entry way! Kimmie, It is the cutest little wedding chapel, like straight out of Vegas! I loved taking my own photos with the tripod (and still bust it out from time to time), but was looking for a more cohesive & polished photography style. I collaborate with Zipporah on some more editorial shoots for businesses, and pay her for her services in relation to what she does for my blog. Love this outfit on you! I want to steal it! Also I love psych stuff as well, fascinating! I'm INTJ (love Myer Briggs). I've taken the IE spectrum to mean not so much "how well do you interact with people," but rather "how much do you enjoy it and do you need quiet time afterwards?" Although I like going out - and love being at the front of a classroom - I definitely need quiet time afterwards. Plus: that is most adorable setting for a very cool (and extroverted!) outfit! Love our twinsies! I think they just came out their own bad selves. As for the MBTI: I'm borderline on pretty much every category. I'm like an extrovert hermit, I think. Definitely a classic oldest child, though! Great outfit and great photo-shoot location! I totally know what you mean about the interested in Psychology. In between Early Childhood Education and Marketing, a did a two year stint in Psych and I would stay up reading the Psych texts FOR FUN. That's strange for me as I never read course material. I often wonder about personality, quirks, issues and relationships and how they develop over the course of one's life. I can't help but psycho-analyze everyone around me. Situations in our lives that we might barely remember can have a profound impact on our development. When I took the Myers-Briggs, I too fell smack dab in the middle of extrovert and introvert. It leaned two points to introvert. The administrator told me that I was too old to be confused about who I am and that it meant I was underdeveloped. She just made me confused... But today (six years later) it makes complete sense to me. I am an introvert unless I am in an environment where I am comfortable. Just try to get me to shut up then. Everyone who has seen me talkative and goofy should know its a compliment to them. I am 100% okay with being half and half and am so glad I am not alone.